We believe that the culture of our agency – who we are as a group and as individuals – matters when clients put their faith in us. So this month, meet agent Lindsey Gonsalves. With our agency for over 10 years, Lindsey is a wealth of knowledge for contractors looking for the right insurance to cover their projects. Lindsey is active in the community of Santee, where she has lived for decades and raised her son Jacob. 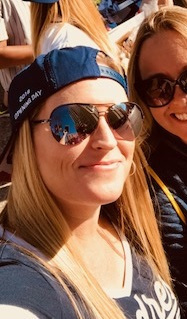 When she isn’t biking, camping, traveling, or cheering on the San Diego Padres at Petco Park, she’s meeting and speaking with clients at their offices, trade shows, or jobsites. Is Lindsey your agent? Would you like her to get you a quote on your insurance? Please call (619) 741-5118, and ask for Lindsey Gonsalves. The Big One's Coming. Are You Covered?